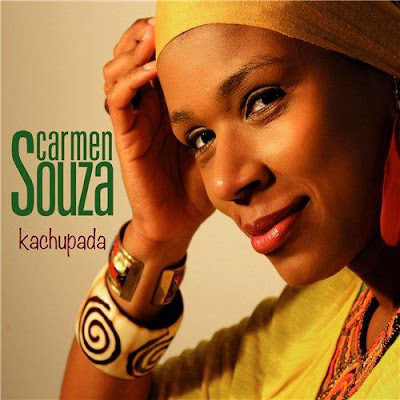 Lisbon-born, to a Cape Verdean family, Carmen Souza is now a London resident, but sings (in the words of David Sylvian) ‘in her native creole dialect with an intimacy, sensuality and vivacity, characterised by a tremendous lightness of touch’. She writes the lyrics, producer/bassist Theo Pas’cal the melodies, of most of the songs (in a genre described by Sylvain as ‘world soul’) on this charming album, but there are a couple of nods to the world of jazz: Charlie Parker’s frenetic bop anthem ‘Donna Lee’, and an arrestingly idiosyncratic visit to a standard, the Sound of Music’s ‘My Favourite Things’. ‘Kachupada’ refers to family and friends getting together to eat Cachupa (Cape Verdean soul food), and there is, appropriately enough, an atmosphere throughout this entirely original-sounding album of informality, joyousness and celebration, the arrangements lean but intense, driven by skilfully calibrated percussion and lithe bass playing, and occasionally tastefully augmented by accordion, flute, guitar, saxophone and flugelhorn. Souza’s voice is striking, strong but flexible, with an attractive rasp and the odd sigh or cry emphasising the songs’ sentiments; overall, this is a highly unusual mix of Cape Verdean rhythms, jazz and soul that should see her audience widen way beyond the WOMAD Festival faithful that currently form its core.